What exactly is MATH IS REAL LIFE? Math IS Real Life is a monthly blog link-up hosted by a math loving dork! The purpose of #MIRL is to bring examples of how I (and others who link up) have used math in OUR real lives in the last month. The hosted link-up is the first Wednesday of each month and often have other friends and math bloggers join in the fun! You can check out our Pinterest boards HERE to read archived posts, grab real-world ideas/ pictures and even some freebies to use in your classroom. 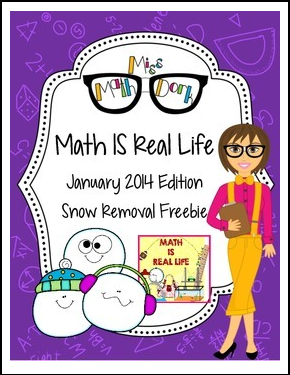 This particular freebie goes along with the January 2014 edition of Math IS Real Life that will be live on 1/1/2014. Make sure to check out the link-up . . . feel free to join in too! This freebie includes a real life snow-removal scenario in which students will calculate the area of a driveway and the volume of the snow removed in the month of December 2013 based on actual snow fall. A bonus question has been added to include a more complex calculation. In addition to the bonus question, the teacher also has the option to have the student calculate the problem in inches (easier, whole number calculations) or feet (more complex, decimal or fraction calculations). Make sure to check out the blog post for real pictures to use in your classroom as well a more guided walk through of the problem.